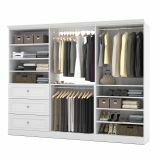 Bestar Versatile by Bestar 108'' Storage kit in White - The efficiency of the Versatile collection by Bestar allows you to enjoy your living space. From the wall unit to the wall bed, furniture pieces in the Bestar Versatile Collection combine practicality and aesthetics. 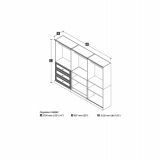 0.75" shelves with a burn-, scratch- and stain-resistant finish melamine. Finished with attractive molding. The kit comprises two 36" storage units with a 3-Drawer set, a base unit and a bridge. 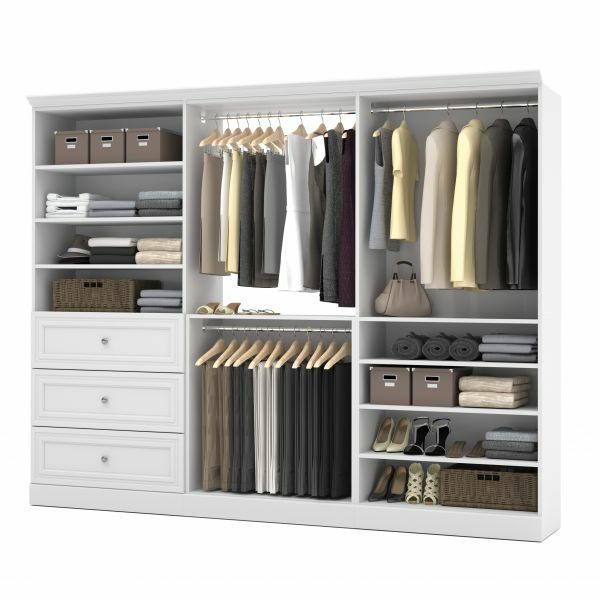 Each 36" storage shell features 2 fixed and 3 adjustable shelves and 2 poles to hang clothes. Drawers are mounted on ball-bearing slides for smooth and silent operation. Satin nickel drawer pulls. The base unit has 2 fixed and 2 adjustable shelves and 1 pole to hang clothes. An additional pole comes with the bridge. Easy to install. Assembly required. 36" storage shell : 35.8" x 20" x 85". Base unit : 35.8" x 18.7" x 40.3".